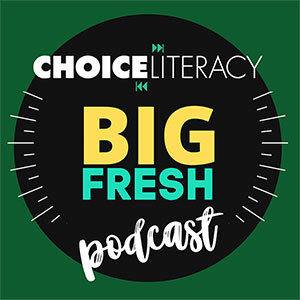 Choice Literacy podcasts feature contributors to the site, as well as other top teacher authors in literacy education. Please note that we are in the process of relaunching our podcast program in the spring of 2019 -- watch for updates and new installments to be announced soon. In this podcast, Jennifer Serravallo shares her “then” and “now” reflections about how guiding groups has evolved in her classroom. In this podcast, Franki Sibberson chats with Lester Laminack about bullying. Lester is the author of beloved books for children and teachers including Saturdays and Teacakes and Unwrapping the Read Aloud . Ralph Fletcher recognizes that many teachers love language and explains how to bring that love of words to young writers. In this podcast, Kelly Gallagher reminds us of the power of the person right next to writers when they are learning the craft. This podcast with Kassia Omohundro Wedekind explores connections between literacy and math instruction, particularly in the areas of strategies, problem-solving, and narrative abilities. In this podcast, author Louise Borden talks about writing from a historical viewpoint. In this podcast, Georgia Heard not only recognizes natural curiosity in children, but sees how teachers can model to encourage that curiosity to grow. If you’re spending some time sifting through new books and thinking about teaching with them, you’ll enjoy this podcast withÂ Ralph Fletcher. Cris TovaniÂ chats about the challenges and joys of a workshop model for teaching reading in high schools. In this podcast, Heather Rader chats with Ruth Shagoury about working with emergent bilingual chidren and their families. In a new podcast, Meenoo Rami talks about ways teachers can bring energy and joy back into their teaching. Katie DiCesare chats with Franki Sibberson about word learning in Katie’s first-grade classroom. Franki Sibberson chats with Jennifer Serravallo about formative assessment in this podcast. Jennifer is the author of The Literacy Teacher’s Playbook, Grades 3-6: Four Steps for Turning Assessment Data into Goal-Directed Instruction. Franki Sibberson chats with Chris Lehman (author of Energize Research Reading and Writing) about how the Common Core is changing the ways teachers approach student research in their classrooms. Franki Sibberson chats with Pernille Ripp about the Global Read Aloud initiative. In this podcast, Penny Kittle chats with Franki Sibberson about how to inspire a passion for reading in adolescents. A full transcript is available below the player. Penny Kittle talks with Franki Sibberson about how to help students grow as readers and writers throughout the curriculum. Jeff Anderson shares some insights from his latest book in this new podcast hosted by Franki Sibberson. Diane Sweeney talks about the importance of focusing more on student work and less on teacher plans and lessons for literacy coaches. In this podcast, Doug Fisher discusses how vocabulary fits into the Common Core State Standards. In this podcast, Ellin Keene shares her thinking about linking oral language and literacy development. In this podcast, Ellin Keene poses important questions to herself about true understanding and its relationship to language in the classroom. In this podcast, Bob Tschannen-Moran uses the strategy of imaginative listening to process an unsettling interaction Heather Rader had with a colleague. In this podcast, Kate Messner points out the cost and kid benefits for skyping with an author. In this podcast, Ruth Ayres is no stranger to working hard to find time to write, but that’s why it’s important that we do. In this podcast, Kate Messner expresses her empathy for how hard revision can be and finds joy in the challenge for all writers. Ruth Ayres talks about the importance of writing celebrations, with tips on how to create a festive mood even before students have written anything “fancy” in the classroom.